This was a Steam Sale purchase for me. Several reviews connect The Vanishing of Ethan Carter to two of my favorites, Gone Home and Dear Esther. There's a lot of similarities between them - like those other titles The Vanishing of Ethan Carter does make use of environmental storytelling, first person narration, etc, which I tend to love. But I also encountered some frustration in figuring out what I was supposed to be doing. The experience reminds me exactly how hard it is to balance player freedom and coherent storytelling. You enter this world in a vibrant wood, following a train track. The sun is setting and there is an atmosphere of decay. The developers, The Astronauts, know how to make use of the Unreal engine. The sun is setting over a lake - in the lengthening shadows you can see, far off in the distance, a collection of houses that you will visit. Knowing that talented storytellers know how to use environmental guidance and foreshadowing I set off, following the train tracks. I observe a few eerie clues that something violent happened - blood on a train car, a stain on the tracks, and, thinking it will all be explained as I press on, I move forward. In doing so I apparently missed a sizable chunk of content. As it turned out a murder took place on those tracks - something I could have explored and thereby come to understand a little about the characters. But, not being told that it was my goal to inspect all sites like a crime scene, I moved forward, missing out on exposition and plot. The first thing I am told is that "this game is a narrative experience that does not hold your hand." Definitely true. Unfortunately the game also assumes that the player will figure out some important details without being explained - something that doesn't always happen. So much of my experience with The Vanishing of Ethan Carter was wandering around, looking for something that would move the game forward, instead of experiencing the story the authors wanted to tell. That story, by the way, was fairly gripping. I ended up loading up a walkthrough and consulting it when I got too stuck. Generally I don't enjoy this, because like the game to push me along at its own pace, but this seemed to be the best gameplay compromise. If you like Lovecraftian horror, you might really like this game. In Dear Esther, you as the player is pretty much on rails. You are presented with a glowing tower in the distance and a trail that will get you there, and you push on along the rails that the game has set for you. Gone Home, too, sets up the goal and then keeps the player on a fairly tight leash. You are given hints of what has happened in this house, and then set up with environments to explore and doors to unlock. The next step (the door that needs to be opened) is always fairly clear. 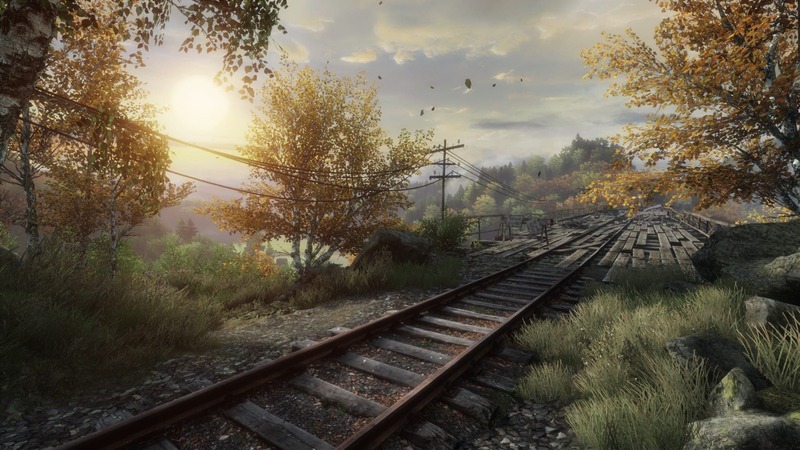 The Vanishing of Ethan Carter creates a world every bit as vibrant, and more ambitious in scope, but struggles to make the "what's next" clear to the player. Lesson learned - environmental storytelling can be a powerful tool for crafting a player experience. But minimizing the information you give to a player can be dangerous, especially when you're trying to explain mechanics.